It used to be that Christians could use a “one size fits all” witnessing tool and could expect results, but many in the world today, especially younger adults, do not see their greatest need as personal sin. Often, the greatest need that they can articulate are problems in the world which Christians see are as a result of the fall. Christians today who seek to evangelize this younger generation need an approach that addresses these needs. I am not suggesting that we should minimize the importance of acknowledging one’s personal sin and seeking forgiveness for it, but I believe the wise evangelist will seek any common ground that can be found then bring the Gospel around from there. The author, while not overly criticizing past models of evangelism, does show where they are lacking and presents a more comprehensive model. He shares what he calls the “Big Story” of the Gospel message which he describes and illustrates in enough detail to be clear, but with enough simplicity to make it easy to share. Each step applies to three levels: systemic, relational and personal, allowing the reader or listener to find his/her position or need within each level and stage. The first step is Designed for Good (Though Choung states he usually begins with the second stage when sharing this model with non-Christians). In this stage, we see how God created the world and humankind to function properly without “damage or shock,” in all three levels. The world (systemic), their relationships with each other (relational) and their personal relationships with God (personal) are all described as being ideal (207). The second stage is Damaged by Evil. This stage displays how the selfishness of humankind has damaged the systems of the world, the interpersonal relationships with each other and their relationships with God (209-210). This is where many who are not yet Christians find themselves. They see the damaged world and are seeking to improve it. They see the damaged relationships in world areas where slavery or oppression is present and are active to make others aware and to urge governments to intervene. Sometimes, they even see the broken relationships around the world, around them, or even as part of their own life. The third stage, Restored for Better, describes how God “moved into the neighborhood” on a mission to restore or heal what had been damaged by evil. His coming allows for a restored relationship with Himself and better relationships with each other, but the systems of the world (now including the many offenses against nature and humanity) are still at odds with God’s ideal and in need of healing and restoration (210-212). Choung brings out that as Jesus came into the world, He brought the Kingdom of God and offers those who would receive Him admittance into this Kingdom. The driving force to this restoration through the Kingdom of God is that while total, ultimate and complete restoration is in the future, Christians (members of the Kingdom) should still be seeking as much of this restoration as can be accomplished in this fallen world. This is why Jesus came, asserts Choung, to bring personal restoration of humanity to God; to bring about reconciliation among humanity and to improve on the world systems that bring an abundance to life which Jesus promises. The last stage is Sent Together to Heal and is the invitation to join in God’s mission with the community of believers to work toward the healing of the world and its systems as well as relationships between people groups that are at odds, and the relationship of others to God. This is evangelism but it is also social action. It involves the Community of Believers in the Missio Dei that God began and communicated throughout the Old Testament and Jesus continued and taught while on earth. These four stages or worlds provide a visual for pre-Christians and Christians alike to find themselves and get on the right track in mission with God. I believe that it is an excellent tool both for evangelism and for persuading the Church to get more involved with the greater work of God, beyond seeking converts to blessing the nations. If I find any weaknesses in this book, they would be few. The first would be using fictional characters to take the reader through the steps of the model. This may just be because of how I learn, but I would have much rather been given the material up front, which comes in the last few chapters. However, I can understand that the author likely used this method to show how explaining the “Big Story” can be accomplished effectively with people the reader knows. I felt a bit manipulated with the fictional professor giving the lessons to the main character. Stating her credentials seemed to be a ploy for us to accept what she said as true, regardless of whether it is or not, simply because the character was an educated university professor. I also felt manipulated when the author had the main fictional character pray that if he learned something that is not from God, that he would forget it quickly, but something that is from God, that He would preserve it in his heart and mind (142). Having this prayer in the story, then the character going to the fictional professor’s office to hear more of her teaching seems like an attempt to subconsciously make us accept as truth whatever the professor said and the main character remembered. The author does eventually share the rest of the story along with the references and sources for some of the statements made by the professor, but while reading the fictional portion, I was feeling manipulated. I struggled also with the fictional professor’s analysis of Heaven being “all around us” as she equated Heaven with the Kingdom of God present (131). With the absence of good Scriptural support, this seems a little off-center to me like the “Divine State of Mind” of Christian Science. Later discussion of this topic does seem to clear it up some, when it is considered that truly the Kingdom of God is present with us (the “already”), while still a place with God in the future where believers will spend eternity with Him (the “not yet). Probably the greatest concern that I have is that the model, as described and portrayed in this book, seems to make conversion as simple as buying into a cause or joining the team. This, I think, would cause the loudest rejection from those who would say that the model described in True Story is just another attempt of the liberal Church to subjugate evangelism to the work of Social Action. However, I do not think that this is the author’s intent and believe that a greater emphasis by the user on the actual conversion experience in step three, can remedy this concern. There are a couple of other small concerns I had, mainly minor statements in the book which reveal the author’s theological background; but even combined with those mentioned above, are not sufficient to deter me from highly recommending this book. I find this “Big Story” model to be of great value. Over the last several months, I have struggled with how to bring together the primacy of evangelism from my Evangelical heritage and the need for a greater work to redeem the world beyond simply salvation, but also seeking reconciliation, freedom from oppression, and other ministries that are often viewed as the work of the “liberal” elements of the Church. I find in this model the relevance I have been seeking which I believe those who are not Christians are looking for, yet Evangelical Christians can still accept. It does not ignore the salvation experience for the promotion of the redemption of society, but rather makes salvation the entrance to being a part of the work of being sent together to heal. I love the way that the entire “Big Story” can be explained in a matter of a few minutes and can be illustrated on something the size of a napkin. Like earlier evangelistic tools, this makes communicating it to others wherever the door is found open quite easy. Though admittedly, the communication of this story is more likely to take place over several conversations, much like the fictional characters in the book. There is much more that could be shared from True Story that is positive and will engage the reader to a deeper reflection of the Mission of God, but space does not allow further exploration here. I do think that the “Big Story” modeled in this book is one that the Church needs to hear and share with the young people in their community. Those young people will continue to seek the healing of the world’s systems with or without the Church, but helping them to discover that God is concerned with many of the same issues they are, can be a powerful tool to lead them to Christ … and to continue the Missio Dei. 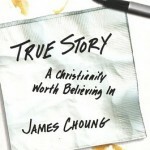 True Story: A Christianity Worth Believing In by James Choung is published by IVP Books and is copyright 2008 by James Choung. More information about the author can be found at his blog site, jameschoung.net. More information about the book, True Story can be found at the authors site or at Amazon. From the back cover: James Choung is divisional director of InterVarsity Christian Fellowship‘s San Diego Division. A frequent speaker and seminar leader, he and his family live in the San Diego area.